We are delighted to announce that we are launching Perfect, our second title for PlayStation VR, tomorrow. 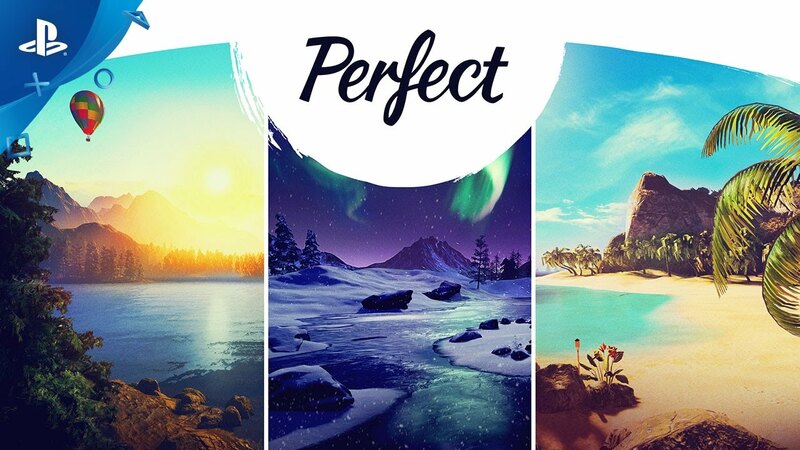 Perfect is an escapism experience that taps into the immersive power of PS VR to let you retreat into three immersive, relaxing, and breathtaking virtual environments. With accessible controls that newcomers and enthusiasts alike can use, along with stunning locations, Perfect is an ideal way to show off your PlayStation VR to family and friends during the holiday. You’ll be able to download Perfect tomorrow for $9.99. To celebrate its launch, we’re giving PS VR’s community an extra-special 20% discount off the launch price. This offer will run until January 4, so you can unwind and escape in the busy run-up to the holidays. 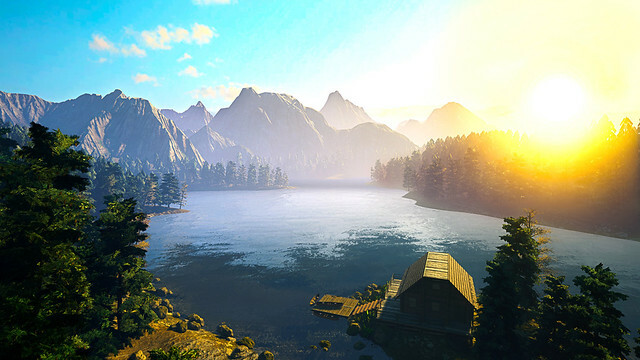 Perfect offers three unique environments: Northern Lights, Tropical Beach, and Mountain Wilderness. Each has been carefully curated to mirror some of the most incredible and beautiful places in the world. Sit back, and enjoy the sights and sounds of each location as you customize the time of day, change your point of view, and discover special moments in your perfect environment. We’ve designed Perfect so that it can be experienced by anyone. The experience is gentle and immersive, with simple controls that make Perfect an ideal way for family and friends to experience the wonders of virtual reality. Perfect also supports PlayStation Move for those of you who want to move around in your playing space and interact with the environment. To elevate the experience, you can stream your own music on Spotify through PlayStation Music, or enjoy the in-game radio, which plays a range of relaxing tracks. If you’d rather soak up the sights and sounds, subtle and richly-detailed background ambience will take you away to that special, relaxing place. Whether you need a quick five-minute experience to show the family on Christmas Day or want to immerse yourself for a whole evening, Perfect lets you leave behind the daily grind and slip away. If you’d like to discover more about Perfect, or if you have any questions, leave a comment below. Always hoped that VR wouldn’t just be limited to games and videos, and I was hoping something like this would release for it as well. I’ll definitely check it out. I’m so sold on this! For the price I will definitely be picking this up tomorrow! Thanks nDreams! Hey Brian! I agree that price for that experience is great. I too will be picking this up tomorrow. Agreed! Day 1 purchase for me! I love using PSVR as a relaxation tool, to be able to just sit back, look around, and just take in the scenery. The ability to easily bring in whatever music or environmental tracks, and customize the time of day of the experience is really great. I’m definitely going to purchase this as soon as it’s available. Thanks for bringing this to us. Thank you, we hope you enjoy relaxing in Perfect! when i get my VR next year i’m on this heavy!! I think every game must have trophies, but at $9.99 there likely isn’t a platinum. Oh, as someone mentioned below, I didn’t realize that some VR experiences don’t have trophies. Will this title have any advantages on ps4 pro? Isn’t VR better on Pro anyways, so yes? We haven’t incorporated any specific updates for the PS4 Pro for Perfect. What is the distance on this for movement? The idea of wandering around in, say, a wooded area is great if the user isn’t restricted to a short distance. You can teleport to unique viewing points within Perfect, but at present you can’t move around the environments freely like you would in a typical game. Although this is not a game will Trophies be incorporated? Some asked me why some VR Experiences do not include them. Perfect doesn’t incorporate trophies, as you mentioned it’s an experience rather than a game. The kind of thing I’ve been hoping for! Thank you! Excellent – we need more of this type of VR experiences. Day 1 purchase for me. This right here is what VR is all about. Thanks for making this! Can’t wait to experience it! Thanks so much, we hope you enjoy it! i’d love to have this exact game except instead of the three locations being “Northern Lights, Tropical Beach, and Mountain Wilderness” it would be instead be various strip clubs. Yes, yes I will buy this. If there is a small house in the forest with Tin roof and I can enjoy the rainfall and thunderstorms consider me in for whatever price. Gonna smoke some jazz cabbage and go on vacation everyone! Perfect! All is left is have the Tecmo Dead or Alive girls frolic around. You know what would be another great addition to this title? How about when the user gets to experience a nice meditation session with, let’s see, some Zen Buddisht monks at a monastery . I’m not trying to be funny, it just hit me as for a potential new idea . OR…you could have a virtual Japanese tea ceremony…. cant find in playstation store, what time does it it go live today?? Yes more than likely after the store updates this afternoon. Is this going to be available outside of the USA? I haven’t been able to find it on the UK Playstation Store today. Yes it will, Perfect launches on the EU & UK PlayStation Stores on December 20th. Perfect will launch on the EU PlayStation Store on December 20th. When will the game be released in Spain? ahhh, just what I need. a little R&R in VR. I’m glad to hear that my spotify playlist will be accessible in Perfect. Well done! Bought the Assembly from Ndreams and I’ve never wished for PS refunds so much in my life. Yeah vr is new, but it doesn’t have to be bad. Just cheap quality and clear cash in. Shovelware VR studio ndreams should be avoided. You won’t trick me again. The environments are beatiful, but couldn’t for the life of me figure out how to interact with them. The lantern at the lake lit up blue when I looked at it, and then fell over at some point. Any tips or hints? Ok so as a gamer it’s kind of boring for me but my wife is really enjoying it. She requests you incorporate some kind of reading application like a Kindle so she can sit on the beach and read. I suggest you don’t because she is already sucking up a good portion of my VR time.. hehe. Is it coming to Australia i have looked at the store and cant see it anywhere and I would certainly get this just so my older eyes don’t have to struggle with the Flickering i sometimes get but that was not the case with star wars vr last night that was fun. Game is immersive, looks good(using Pro) my only issue is so many of the VR games(i love PSVR!) keep us stationary or on rails. Games need to start giving us movement e.g. the RE demo allows us to MOVE. Robisons Journey allows us to move also.